Place shiitakes in a stockpot. Cook over medium, stirring often, until fragrant and darkened in spots, 2 to 3 minutes. Transfer shiitakes to a plate. Add star anise and cassia bark to pot; cook, stirring often, until fragrant, about 1 minute. Add 3 quarts water, soy sauce, wine, smashed garlic, dried ginger, thick soy sauce, smashed ginger, sugar, 2 teaspoons salt, and shiitakes. Bring to a boil over high. Reduce heat to maintain a vigorous simmer. Cook, uncovered, until aromatics infuse broth, about 30 minutes. Carefully submerge chicken in stock, increase heat to high, and bring to a rolling boil. Remove pot from heat, and let stand, uncovered, until internal temperature of chicken reaches 150°F, 35 to 40 minutes. Meanwhile, combine vinegar and maltose in a small saucepan. Cook over medium, whisking occasionally, until maltose is dissolved, about 3 minutes. Remove chicken from stock and place on a wire rack set inside a rimmed baking sheet. Pour stock through a fine wire-mesh strainer into a bowl; discard solids. Reserve stock. Brush warm chicken with vinegar-maltose glaze 3 times, drying 5 minutes between each addition. Discard leftover glaze. Chill chicken on rack, uncovered, 8 hours or overnight. Heat 2 inches of oil in a large, heavy Dutch oven over medium-high to 350°F. Cut chicken into 8 pieces (2 drumsticks, 2 thighs, and each breast cut in half diagonally, with 2 breast halves attached to wings). Discard backbone. Fry chicken pieces in 2 batches until skin is crispy and internal temperature reaches 165°F, 3 to 4 minutes. Transfer fried chicken to a paper towel–lined baking sheet. 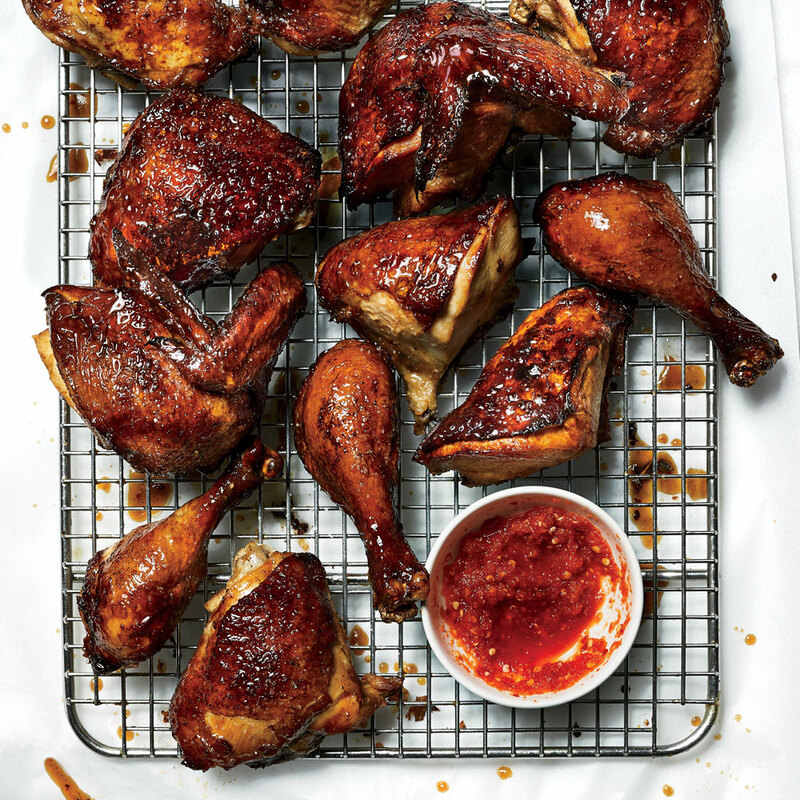 Season hot chicken immediately with salt. Lime Hot Sauce, and Chicken-Fat Rice. The master stock can be made ahead, strained, and chilled for up to 1 month. Bring to a boil before using.